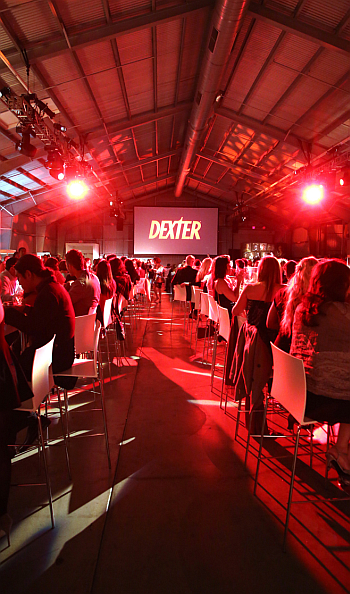 THR reports: The end is near for Showtime's Dexter, which officially kicked off its upcoming eighth and final season Saturday night with a fittingly blood-soaked premiere party at Milk Studios in Hollywood. With massive key art posters from each of its eight seasons paving the way for hundreds of executives, actors and industry insiders, Showtime sent its Michael C. Hall and Jennifer Carpenter serial killer drama off by offering guests a glimpse at its past. The cavernous warehouse -- which easily could have doubled for one of Dexter Morgan's massive kill rooms -- was lined with showcases featuring some of the show's most iconic set pieces, transported from the set's prop warehouse. Dexter's prized box of blood slides and knife kit -- both one-of-a-kind items hand-delivered by the show's prop master -- were among the most buzzed about items decorating the venue in well-protected large glass display cases, as Dexter still has two episodes to film. Hit the 'read more' button for the rest of the article. Long white tables, where guests set up to dine on shrimp and treats from Coolhaus ice cream sandwiches and cupcakes from Magnolia Bakery, were decorated with encased badges from those within Miami Metro: Debra Morgan, Joey Quinn and Angel Batista, among others who have come and gone before them. Metallic gray walls were decorated with portraits of some of Dexter's biggest foils: Jimmy Smits' Miguel Prado, Erik King's James Doakes and John Lithgow's Trinity Killer, the latter of which likely gave Julie Benz pause as he was the one responsible for her bloody bathtub death. "I promised I wouldn't start crying," Showtime entertainment president David Nevins told the assembled cast and crowd in his opening remarks. "It's a privilege to be here after eight seasons and nine, probably closer to 10 years since [executive producer] Sara Colleton read the book Dexter Dreaming Darkly and said, 'I think there might be a television show here.'" Citing Dexter's impressive awards-season track record, Nevins called the series a "pop culture phenomenon" and rare genre show to be ranked on the WGA's recent list of the 100 best-written shows of all time (positioned at 66). "This show has really written its way into history, and it's been very important to the cause of original programming at Showtime," he said. "This show put us on the map and paved the way for everything that has come since." After citing scores of cast members, producers, behind-the-scenes crew, and marketing and publicity staffers, Nevins handed the stage over to Hall, who did the same. "Every person in this entire [Dexter] world -- and there are about 100 people involved with this show -- everybody has spent eight years, or some approximation of their life, doing this and carrying around this extraordinary sense of anticipation and closure," Hall said. "This has been an amazing eight years." "This ending has been planned for a couple of years, and every few months or so I kicked the tires and said, 'Are you sure you want to end? Are you sure you want to go?'" Nevins said. "But they had a story in mind, and [showrunner] Scott [Buck] and Sara and Michael and [EP] John [Goldwyn] stuck to their guns, and they're doing the end that they wanted to do. And this is the beginning of the end." After screening the first two episodes of its eighth season, guests enjoyed the live music from the series, performed by Daniel Licht and the Dexter Ensemble -- the same musicians who created some of the creepy score and other original tunes that have haunted viewers during the show's run. Others took advantage of a kill table video booth where they could stand in Dexter's black apron, goggles and gloves and have their way with a victim of their choice -- all recorded and transferred to Dexter-branded flip books -- as a massive portrait of the famed serial killer lorded overhead. Once the party thinned out, the room resembled a space where Dexter Morgan may have had his way as blood-stained petri dishes decorated the now jumbled tables and chairs.